Retief Goosen won the 1995 South African Open here when the course was still known as Randpark and “The Goose” was very impressed with the layout, as was Sweden’s Mathias Gronberg who won the 2000 edition of the SA Open here when it was sponsored by Mercedes Benz. However since the revamp the layout is much-improved and would be a wonderful venue for future SA Opens or Joburg Opens. Superbly conditioned, it is longer and a little more difficult than Bushwillow with a great finish as 16, 17 and 18 are extremely demanding holes – all three potential card-wreckers. No 1, par-4, 372m: From an elevated tee, there are fine views of this beautiful hole spread out before you, with the Fairview Hotel out to your right. The drive must carry the river which is about 100m distant from the men’s club tees. Strategically placed fairway bunkers and a stretch of water hugging the fairway on the left add to the challenge of a testing opening hole. No 2, par-5, 476m: This truly spectacular hole – both visually and in terms of the skill required to master it – is flanked by the river hard on the right all the way from tee to green. The drive must be both accurate and reasonably long to set up a possible par or birdie. Intelligent play is needed here as a long, deep, wicked bunker on the right of the fairway near the green can cost you a shot or two if you make the big mistake of going in there. No 3, par-4, 368m: Yet another Randpark dog-leg, this one bending right to left. The bunkers, both fairway and greenside, are an issue here and confident, well-thought-out striking is required to avoid these hazards. The entrance to the green is on the right and if you’re able to execute it, a pronounced “bend-it-like-Beckham” draw, will serve you well here. No 4, par-5, 490m: A straightforward, downhill hole appealing to the grip-it-and-rip-it in all of us. The fairway bunker on the left is not a place to be but a good drive down the fairway invites you to have a go and get as close to the green as possible, and if you’re a big hitter this can be a two-shotter for you. If the pin’s on the left where the green is just a narrow strip then having a go at the flag is a risky business and it might be better to play safe to the right, take your par and walk to the next tee. No 5, par-3, 158m: Firethorn has plenty of big greens and this is one of them. A huge bunker short and left is not a nice place to be as to get up-and-down from there is challenging to say the least. The entrance to the green is on the right, and for many the best route to the heart of the putting surface is to aim at the right hand greenside bunker and hit a little draw. No 6, par-4, 344m: One of the seven brand new holes on the revamped Randpark, this has a US PGA Tour look about it. It’s a feast for the eye as you stand on the tee. The fairway slopes down from right to left, so aim just far enough right to avoid the fairway bunkers. From your spot on the splendid, closely-mown turf, hit your approach out to the right and watch as the slope feeds your ball towards the centre of the green. Try and block out from your mind the awful, cavernous bunker just short of the left side of the green. No 7, par-4, 380m: A dramatic hole, which curves both ways in direct relation to the river on the right which is very much in play from tee to green. For the drive, the landing area for the shorter hitter is generous but becomes narrower for the “bombers”. Par here is an excellent score as the approach is a treacherous one because of both sand and water looming large. No 8, par-3, 170m: Once more, you need to have your wits about you as the river is ominously close. Leak your tee-shot out to the right and, almost without exception, you’re in the dreaded drink. When the pin is back right, just metres from the water, the sensible play is middle of the green. Six, seven and eight on Firethorn wouldn’t look out of place on Major Championship courses in America. They’re that good. No 9, par-4, 318m: Short and sweet if you can avoid the fairway bunkers or the cluster of traps surrounding the green. A straight drive to a wide fairway, a well-struck second and a par or one-putt birdie is in the offing. Some of the outrageously long “young guns” can actually drive the green here. No 10, par-4, 394m: A long (especilally off the back markers) left-to-right dog-leg and a difficult, tree-lined start to the back nine. The drive is over the river with fairway bunkers in play in the landing area. The second shot for most players is a long one to a well-trapped green. No 11, par-4, 380m: Straight and comparatively open although the entrance to the green, with bunkers short left and right, is narrow. The green, as are many on Firethorn, is full of slope so the putts need some careful “detective” work to find clues as to both pace and line. No 12, par-5, 494m: With clean shotmaking, a par is always on the cards here even for the higher handicap player. The fairway is quite wide, although a strategically placed bunker in the middle of the fairway about 50m short of the green can be a problematic obstacle. Land in there and the next shot is extremely challenging. The green is a very large one and putts in the 60-foot range are not uncommon. No 13, par-4, 376m: Straight and easy on the eye and because it’s downhill it plays a little shorter than its yardage. Not too much trouble here and therefore a good scoring opportunity. Humps and hollows on the putting surface, though. No 14, par-5, 488m: A no-go rocky outcrop covered in dense foliage about 200m from the tee-box on the right must be avoided like the plague as it’s definitely lost-ball territory. Staying on the fairway all the way to the green is key here to set up a satisfying par although a hellish in-your-face bunker fronting the green can be a card-wrecker if your all-or-nothing approach doesn’t come off. It’s often better to aim right where the entrance to the green is, and the ball will generally roll to the left and, hopefully, closer to the cup. 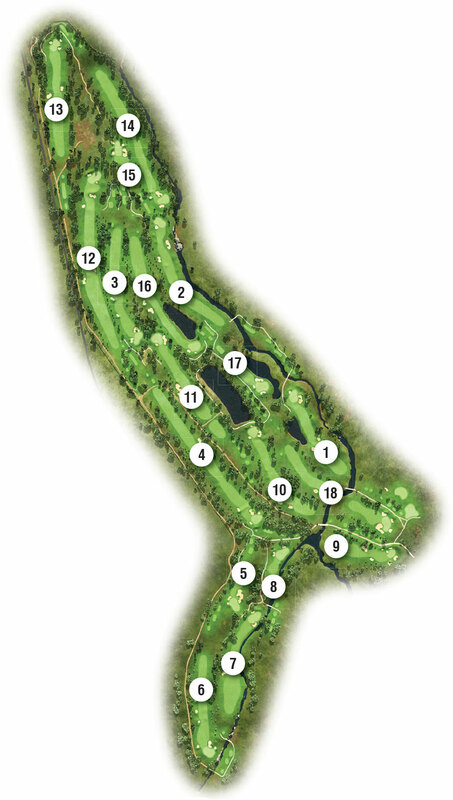 No 15, par-3, 164m: The green front to back is extremely long and full of slope. So if you under-club or over-club you could be struggling to avoid a three-putt. A safety-first tee-shot hit a little short and a little left invariably will see you ball kick onto the putting surface. No 16, par-4, 412m: Augusta National has its famous Amen Corner, the relentless stretch of holes consisting of the 11th, 12th and 13th. Firethorn, too, has a ‘Death or Glory” collection of holes – 16, 17 and 18 which collectively make for a terrific and extremely demanding finish to the round. The 16th is a long, dog-leg left with a large dam on the left right up against the fairway from about 130m short of the green all the way up to the green, and the fairway slopes towards the water, accentuating the danger. If the flagstick is on the left of the green, the approach may be directly over the hazard. Often, the wise play is to come in from the right with a right-to-left shape on your shot. No 17, par-3, 192m: Visually, this long, water-beset par-3 is a beauty but as far as the golf goes, it can quickly ruin a good round. Any tee-ball hit only marginally left will most likely end up in the dam. So the tendency is to favour the right but then you’re flirting with a bunker. Double-bogeys are not uncommon here but a par is a rich reward for smart play. No 18, par-4, 445m: There can’t be many tougher closing holes than this uphill monster, which used to be a par-5. The river bisects the hole at about 140m from the green and shorter hitters often find they need to lay up short of the water, leaving them with a substantial third shot. Only a small percentage of club golfers will be able to get up in two and then there’s the further challenge of a huge green with loads of slope. Par is extremely hard won and a bogey five is no disgrace. Firethorn is a stern test and if you’ve played to your handicap, go straight to the bar and reward yourself with a drink. Maybe two! The following videos are presented by Martin Whitcher Golf Schools. The multi-award-winning Randpark Golf Club and Fairway Hotel & Golf Resort offers extensive facilities and services with a resort feel in the heart of Johannesburg. This ultimate urban golf destination is on par with excellence offering extensive play and stay packages to business travellers, golf groups and leisure guests who choose to experience a taste of the good life. With two uniquely different golf courses, The Brewery overlooking the two tiered Driving Range serving trendy craft beer and gourmet burgers, a fine dining Restaurant in the form of the Balata Restaurant and luxury accommodation at the award winning Fairway Hotel and Spa it’s one of the most desired golf destination in Gauteng. Following the highly successful and well received renovation to the Bushwillow Golf Course, the much anticipated renovation project on the Firethorn Golf Course started on the 01st June 2014. The Fairway Hotel & Golf Resort is situated on the Firethorn Golf Course, 2km from Cresta Shopping Centre in Johannesburg, this new, slick city hotel provides the ultimate destination for golf tournaments, wedding, conference and leisure guest in a safe and tranquil environment. The R140 million 5-star development overlooks the famous Firethorn Course and is situated just north east of the clubhouse, on the 1st hole. The Fairway has 62 hotel rooms and 14 double storey Golf Villas, each with 4 en-suite rooms. The hotel rooms include 35 luxury rooms, 16 premier rooms, 1 paraplegic room, 2 Suites and 8 family rooms. Gym, tennis court and spa facilities further add to the enjoyment and comfort of guests during their stay. The 8, 200m² hotel comprises a multi-volume foyer and private internal pool courtyard, a conference centre, boardrooms, breakaway rooms, lounge and deck with stunning views. Brides can look forward to a magnificent chapel and the Windsor Ballroom for hosting their function. Predicted to be the meeting venue in Johannesburg, Bar Verve is set to become renowned for after work cocktails which may well extend into unparalleled late night Fine Dining in Balata Restaurant.